Google offers a wealth of APIs for CSS3 that cover everything from working with Ad Exchange to presenting driving instructions with Google Maps. In fact, there are so many APIs that most developers have no idea of just how many of them exist. That’s why the Google APIs Explorer is important. It helps you find and access all the APIs that Google supports. 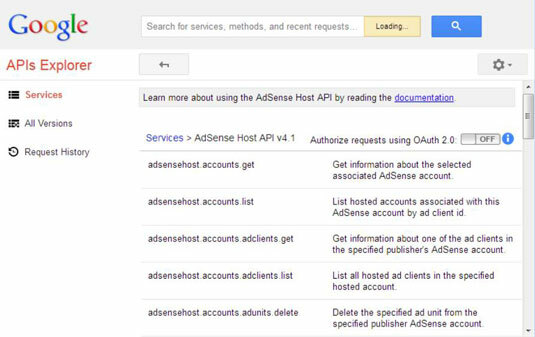 You can access many Google API features without a Google account. However, many of the features do require an account and it’s usually easier to sign up for one at the outset. For example, when using Google Maps, you must obtain a token to make requests from the web service. To start the process, all you need to do is go to Google Accounts and click Sign Up. You go to this page. After you answer a number of questions, you click Next Step and follow the remaining directions. 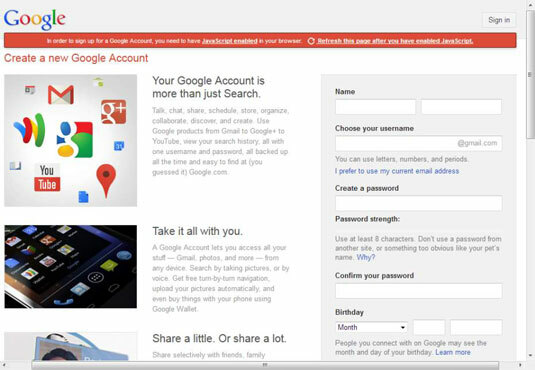 It doesn’t take long to obtain the account and verify it through your e-mail account. Even if you don’t use the account for other items, you’ll need it for development purposes. In some cases, the documentation for a particular API will recommend that you obtain two accounts: one for development and another for testing. The reason for this suggestion is that you could possibly lose data by working with the API. If you use data in your test account, it’s usually not a problem. However, losing data in your development account could set back your application development efforts. Creating two accounts when necessary is always a good idea. To work with many of the APIs, you must obtain a developer key. Google provides two kinds of keys: paid and free. You need only the free key for experimentation purposes. The paid key does provide considerably more flexibility, and you’ll likely need it for any full-fledged application you create. However, for experimentation purposes, the free key works just fine. The Google API you’re using will tell you about the developer key requirement as part of the documentation. (Even if it doesn’t tell you, you’ll discover the requirement the first time you try to make a request). For example, you obtain a developer key for Google Maps at Google Developers. 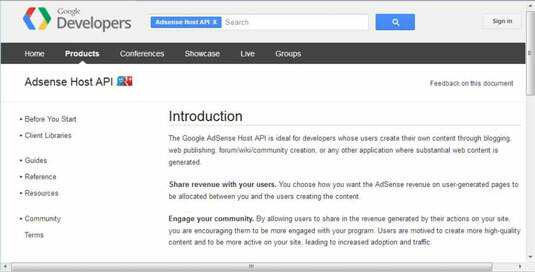 Make sure you understand the terms of service fully before you begin working with the Google API. 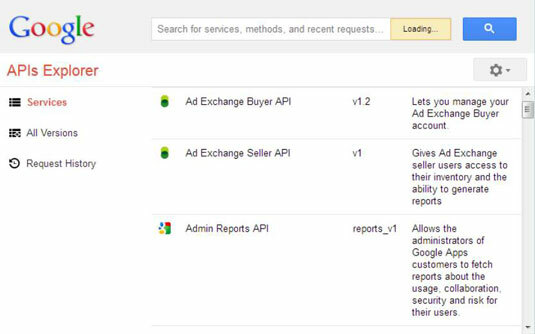 Whenever you go to the main Google API Explorer page, you see a listing of the APIs. In addition, you obtain a short description of the API, the API version, and whether you’ll have full access to it. Some APIs have paid support for full access or have some other requirement for their use. Unfortunately, this page won’t tell you which features are missing or why the support is limited. When you click a link for a particular API, you see a page that provides a short description of the API, a link to the documentation, and a listing of the calls for that API. The call listing includes a short description of each API call. The listing is there to help jog your memory when you’ve forgotten a call. Make sure you read the documentation for an API thoroughly before you try to do anything with it. Clicking on a particular API call displays a page containing additional information about that call. In addition, you see a test page for actually executing the call to see what it does. All you need to do is fill out the fields and click Execute. The documentation page provides access to a wealth of resources for working with the API you’ve selected. Each API starts with an introduction that tells you all about the API. You find links for getting started, working with client libraries, and interacting with the community that uses the API. 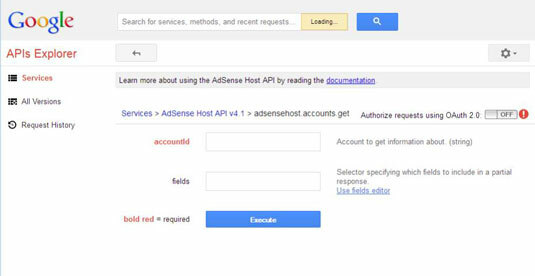 In addition, each API provides access to a guide describing how to use the API, a reference containing API specifics, and a connection to any resources that the API supports. One of the most important (and probably overlooked) links on the documentation page, however, is the Terms link. Make sure you understand the terms for using the API. Unfortunately, some developers run afoul of the legal requirements and find themselves with a nonworking application as a result.